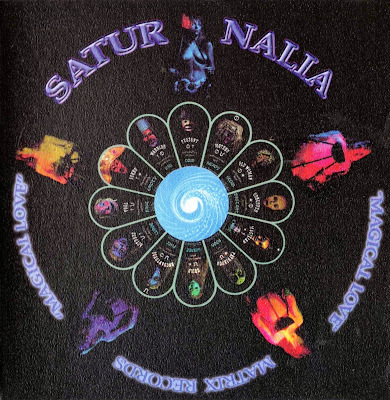 SATURNALIA was an obscure Brittish psychedelic band, leaving only one studio album as a target for the collectors of psychdelic rock albums. The record "Magical Love" was produced by Keith Relf (from RENAISSANCE and YARDBIRDS), and it was released year 1969. The album contains slightly occult themed psychedelic early progressive rock, resembling JEFFERSON AIRPLANE with their similar male/female double vocal concept and US West Coast psych guitar tones. The singers were Adrian Hawkins and Aletta, guitar was played by Rod Roach and the rhythm section had Richard Houghton on bass guitar and Tom Crompton playing the drums. Another comparison for the occult themed progressive rock album with male/female vocals could be BLACK WIDOW's "Return to The Sabbath", the first deleted and later reissued version of their "Sacrifice" album. The definite versions of "Magical Love" album has a 28-page booklet about the astrology, which was a strong element to the players doing this record. Certainly a nice and recommendable obscurity for the album collecttors for the fans of mentioned themes.